At last a comment !!! All I wish to do is find out if there is any information available about what is quite definitely the most serious matter the Society has ever had to consider in its history. At the present moment I have no confidence in what is going on. The minister of St Mary's Church appears to have abandoned the graves in his care. There is no information being imparted to the Membership. Do we have to wait until September before we can flip the flaps of the Gazette---which may or may not have some information for the readership ? One solution, I have already mentioned on this blog. Another is to bring Anne to St Michael and All Angels graveyard and re-inter her remains outside there. There are undoubtedly others--but where are they ? If it is decided to re-inter Anne's remains inside the vault I do not see why pneumatic drills cannot be used to open up a space for the undertakers to place Anne inside. The importance of the need to sweeps aside any other objection. I do not know if there is a vault---that is space. Or if it has been filled in completely, covering each individual coffin. The celestial choir that is our Council continues to sing the great hymn of silence. Any decision must surely involve the Membership, communication and debate is the thing. A newsletter from Hon. Sec. of the Council would be a great help and source of information as it was when first sent and then abandoned. It would be preferable not to have cars parked in such an area, but I take the point that it will allow elderly and disabled people access - the steepness of the path up to the churchyard and castle make it difficult for many people to visit. It's a situation which does need to be watched, however. 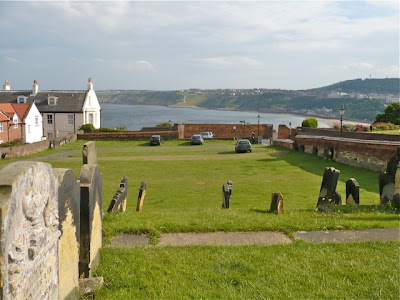 Whether Anne wanted to be buried at Scarborough will always be a moot point. My own impression is that she did but, since her thoughts were turned so resolutely to the afterlife, she might not have cared. The suggestion that she should be exhumed and reinterred in the Bronte vault is not feasible, not least because when the new church was built, the burials existing burials were covered in concrete. The vault is not accessible without the use of a pneumatic drill. The Brontë Parsonage Museum is gearing up for a busy summer of events beginning in the week commencing 26 July. Write your own Bodice Ripper! on Wednesday 28 July, will invite visitors young and old to join in with a series of fun writing activities. On Wednesday 4 August artist Rachel Lee will be making Snapdragons in Silk, running silk painting activities for children. Visitors to the museum on Saturday 7 August will be able to enjoy artist Orly Orbach creating ‘pyrographic’ illustrations on tree stumps which visitors can take rubbings from. There will also be a chance for youngsters to try their hand at book making and cross stitch and other Brontë-period pastimes in Hands on History which will take place on Wednesday 11 August. There’s interactive storytelling for children with Tall Tales and Riddling Rhymes on Wednesday 18 August and a Churchyard Challenge trail for families on Wednesday 25 August, exploring what living things lurk in the Churchyard! As well as new displays around the Parsonage and lots of hands on activities for children and families the museum will also be opening a remarkable new exhibition of paper-cut installations in the historic rooms of the house by artist Su Blackwell on 21 August. This will be followed in September by Haworth’s first Brontë Festival of Women’s Writing, which brings together an exciting programme of events including readings from and discussion with the poet laureate, Carol Ann Duffy. And for those looking for a bargain day out, special vouchers have been distributed around the shops and cafes on Haworth Main Street giving two people admission to the museum for the price of one. These will be available from Friday 23 July … but be quick, there are a limited number! To remind people of what was said in the Brontë Society five years ago on the subject of Anne Brontë's grave, here is issue 37 of the Gazette. Turn to page 7. I observe that in England the graveyards are not respected or looked after as in some other European countries. When I have visited old churches when rambling in the countryside, I see that many graveyards are either neglected, or wild flower gardens. An exception could be the military cemeteries, which are designated to be very well looked after constantly. As a member of the Brontë Society, I wish to do my utmost to convince the Brontë Society members that it is time to bring Anne Brontë's remains to the vault in Haworth. At this moment she has no protection whatsoever. She lies in what is now unconsecrated ground, and this is a disgrace. The Council of the Society must not be afraid of asking the membership to vote on the exhuming of Anne's remains and the remains of her original coffin to be placed in a new coffin and returned to Haworth, the family vault opened and Anne placed there. A regular photocopied newsletter would keep members informed; a direct contact which is necessary. Are the council in contact with Dr Sentamu? I do not believe that we can ever do anything to guarantee her grave from very serious damage at any time in the future. Obviously it is a pay-and-display car park, so there is no one there to oversee car placing. My fondness was but half returned "
To move Anne's body is the right thing to do, and we must not be afraid to do it. Having made my pilgrimage to Anne Brontë’s grave last weekend, I was very interested to read the article on the Brontë Parsonage Blog. The subject of the grave can be guaranteed to be touched upon at the Brontë Society’s annual general meeting next June - and of course Haworth itself is no stranger to controversy regarding car parking. If the mortal remains of Anne Brontë could not be deposited in Haworth I always think that the spot Charlotte chose is idyllic- just below the dramatic ruins of the castle and overlooking the bay Anne had come to love. Much has been debated through the years about the state of the headstone and surrounding ground but last week it was my opinion that the grave has never looked better. Of course the stone itself has suffered some understandable damage through the years and this last severe winter has taken its toll on one or two letters of the inscription but compared to other stones in the surrounding area it has stood the test of time surprisingly well. The area in front of the headstone is now grassed over and level - which will make, I guess, tidying and mowing much easier. A very tasteful arrangement of flowers had been left in tribute to the youngest member of that remarkable family. The area where cars are now allowed to park is visible, yet quite some distance, from the grave - being separated by a steep incline. 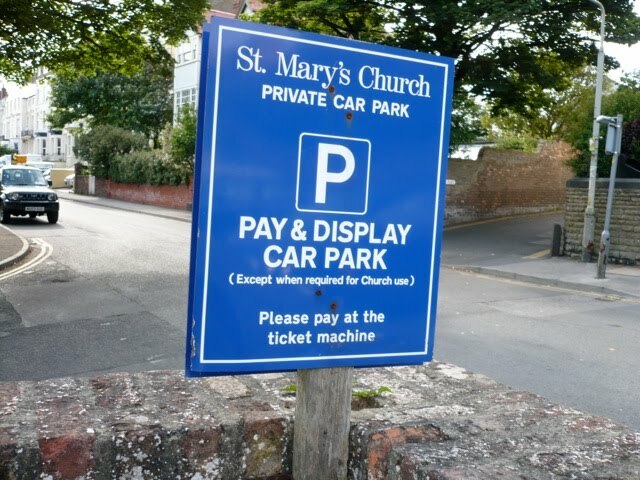 Car parking in church grounds and on reclaimed churchyards will always be controversial, and I would not wish to comment on the rights and wrongs of the church allowing their land to be used in this way, but would certainly respect that personal opinions will be varied. However to show, perhaps, another perspective on the subject, as I was sitting near the grave, admiring the view and savouring the peace and quiet, an elderly man and woman came to sit on the same seat. 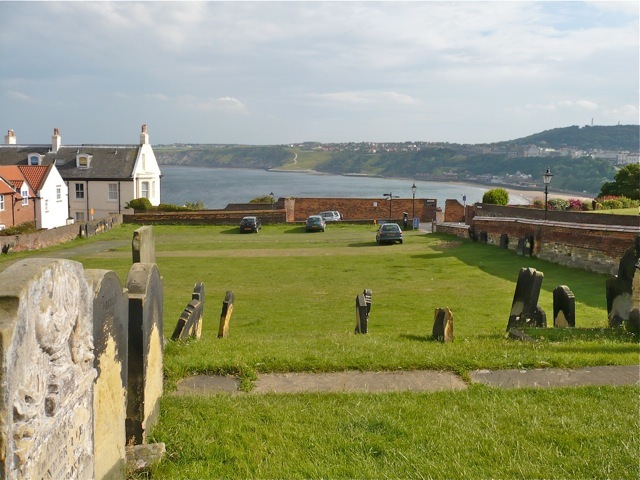 We got chatting and they told me that when they visited Scarborough they always liked to spend a little while at the grave side and they were so pleased that they were able, now, to park on the grass on the church land. Parking in the vicinity is allowed only by permit or disc, there were never any spaces and the climb up from the sea front or the town was impossible for them now. I am sure that you will be receiving more correspondence on this issue regarding the latest use of the land - once an Iron Age settlement - which has survived siege and attack over many centuries. Please let us have your views. Send them to heveliusx1@yahoo.co.uk, or click on 'post a comment' below.